Walking too close to this building would be quite dangerous..
Those are some serious icicles! Really beautiful – great capture, Frida!! Great, I have never seen so much ice on a single house. Very pretty, Frida. Love that icy fringe hanging down. It would look quite different in the spring, with the vines in leaf and the window shades folded out. a very nice image..beautiful lightness and details..bravo! Roof needs a little insulation! Nice photo. 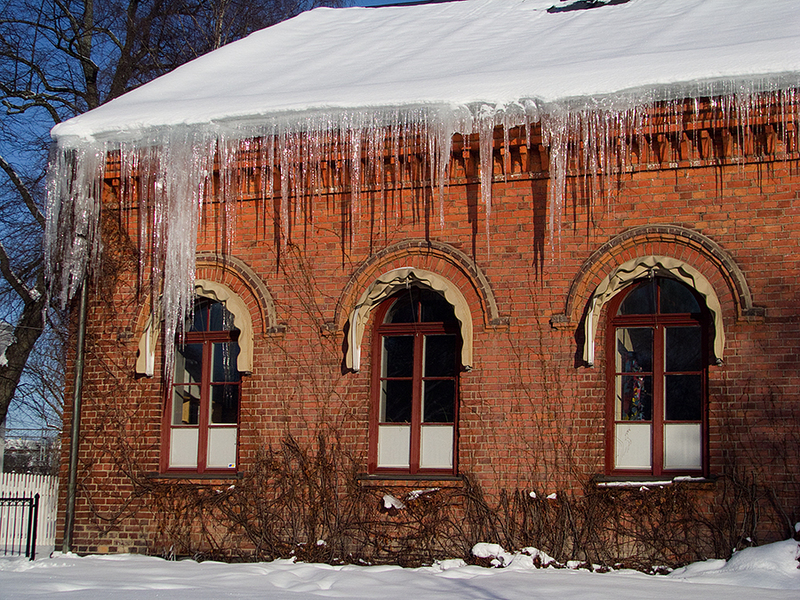 I\'ve never seen such large icicles…and in the sun! Beautiful, Frida. Huge icicles always look attractive to me. It is difficult to make them look as attractive in an image as they seem in real life. I like how you\'ve chosen to show the side of this building. The building itself, the the arched windows, has strong appeal. Nice one. This has a wonderful sense of cold reality about it – the lighting has added so much, too. Shiveringly good ! I took one of icicles last night, but unfortunately they were not on near as beautiful a building as this one! Nice lighting and angle on he building. Such gorgeous color. Those icicles are a work of art all of their own. Love your new template design!! !